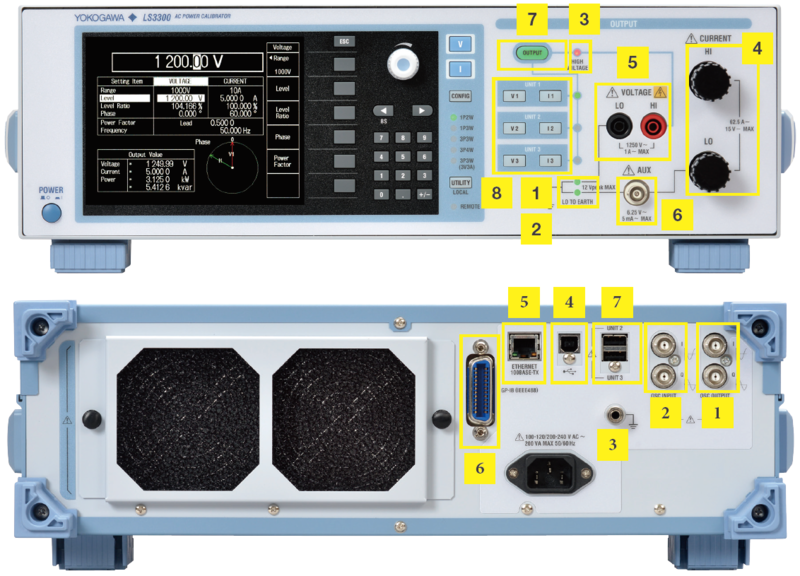 Built upon Yokogawa's history of developing superior sourcing instruments, the LS3300 is an AC signal generator capable of outputting both current and voltage simultaneously, thus allowing it to calibrate power measurement instruments such as current clamps/transformers, panel meters, RMS multimeters, and power meters. The LS3300 boasts 78.5kW per unit, with user-configurable current, voltage, frequency and phase settings. New features include a high definition LCD display, a vector diagram, and the ability to synchronize up to three units to emulate anything from single phase two wire to three phase four wire systems. 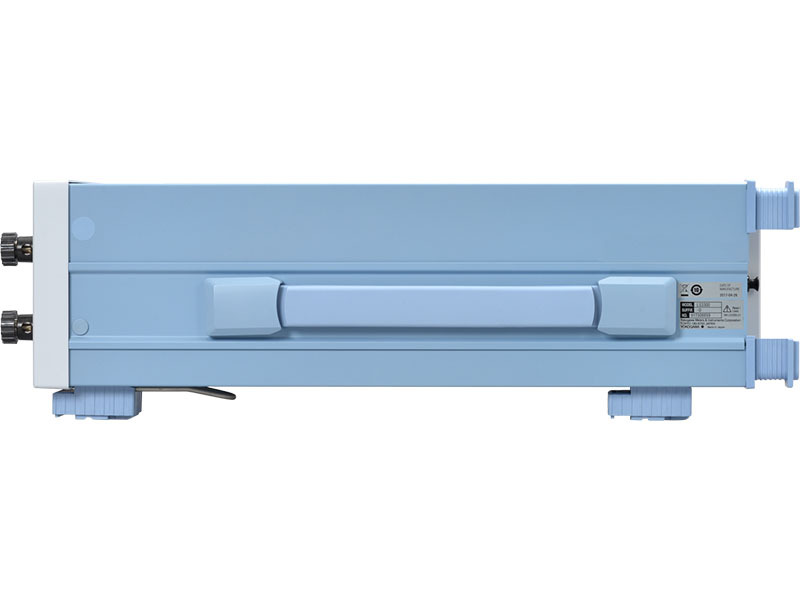 The LS3300 features ease of use, powerful dedicated functionality, and high precision sourcing capabilities. Featuring an intuitive interface, users can quickly and easily adjust the voltage, current, frequency and phase values to suit their application. The LS3300 is a single-phase AC power calibrator that can generate highly accurate, stable, and wide range output current and voltage. New features include an LCD display and a “STABILIZING function” which shows that the output signal is stabilized for calibration efficiency. 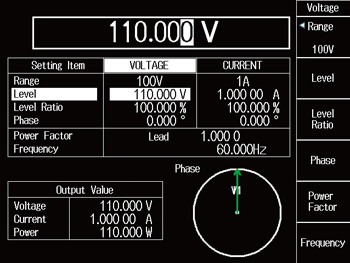 Between the Voltage and current outputs when used alone. 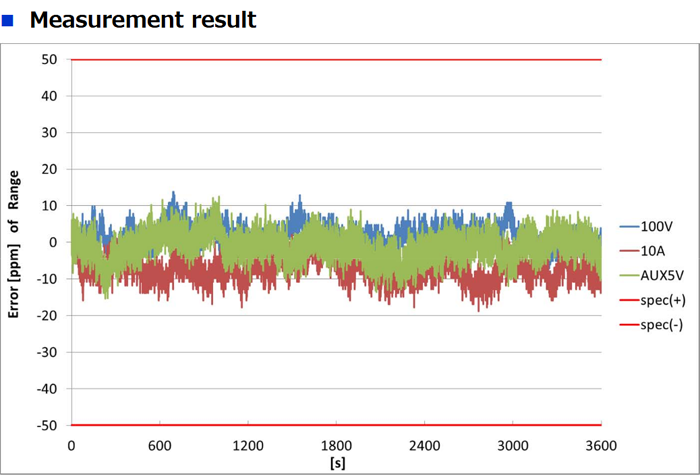 From 1 minute to 1 hour after the output is turned on. 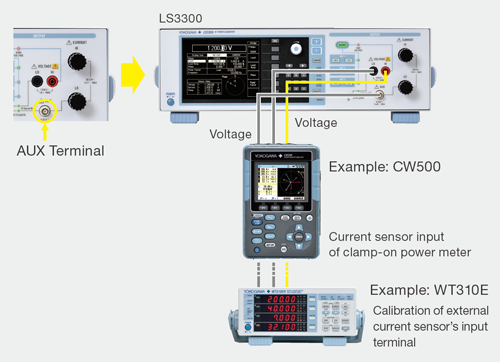 A single LS3300 AC Power Calibrator unit supports 1P2W, and multiple LS3300 units support 1P3W, 3P3W and 3P4W. It can calibrate AC voltage/ current, active/reactive power, power factor and phase angle. 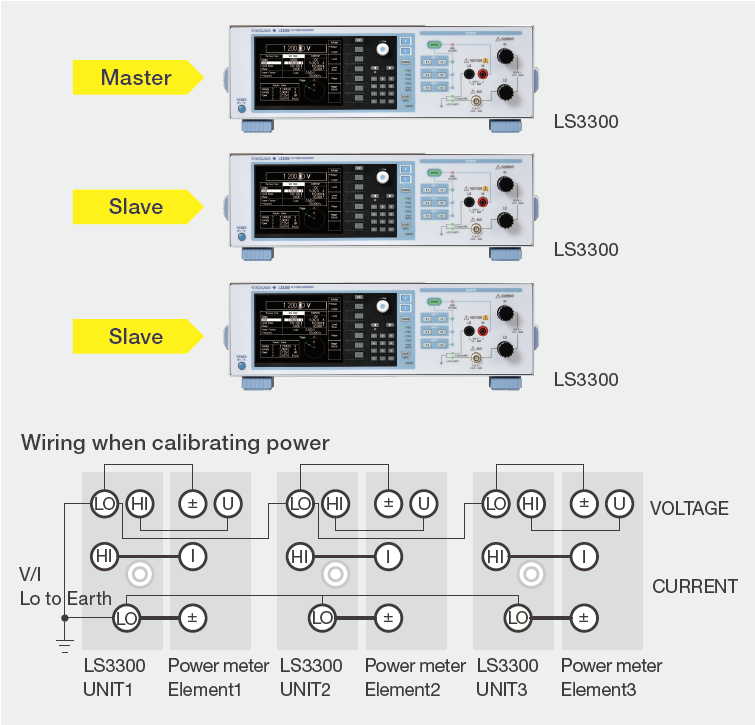 Multiple LS3300 AC Power Calibrators can be synchronized through BNC cables. The host can then connect all units to the master unit via a USB cable and adjust settings simultaneously through the master/slave communication. 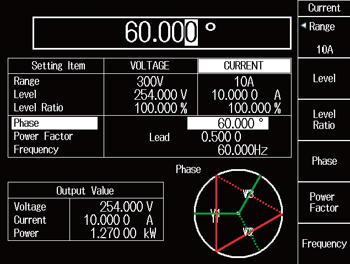 Users can set the values of voltage, current, power, power factor, wiring, and phase from the front panel of the master unit and view each phase in a phase chart in the LCD. Checking the output of each unit from the master unit during three-phase output is done by navigating to [CONFIG] > [Unit] key > menu. 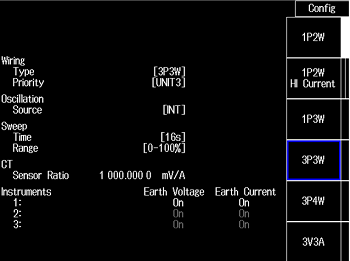 In the case of balanced phase signals, when users modify settings on the master unit, values on the slave units are set accordingly. Synchronous communication allows output setting changes on the master unit to be migrated to the slave unit. If a fault such as an overload occurs in the slave unit, this information will be conveyed to the master unit, and a shutdown of the output is initiated. In the case of unbalanced phase signals, users set the conditions of a balanced state for the slave units on the master unit. Then they change the phase setting into single phase and manually set conditions of the unbalanced phase state of each phase on the slave side. 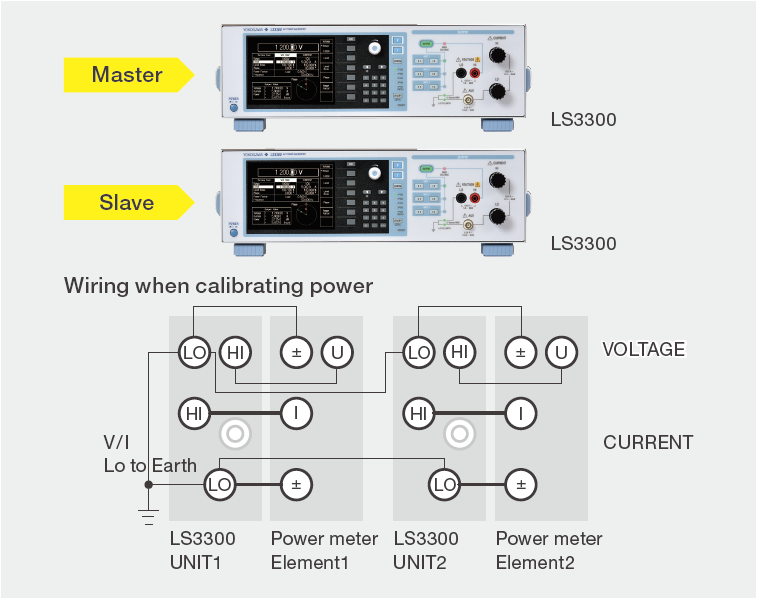 Other power calibration systems in the market utilize a master/slave interface where-in the slave units cannot be operated standalone for single phase output. Each LS3300, on the other hand, is capable of both independent single phase output, as well as synchronized three phase output. Its excellent portability enables feasible on- site calibration service. 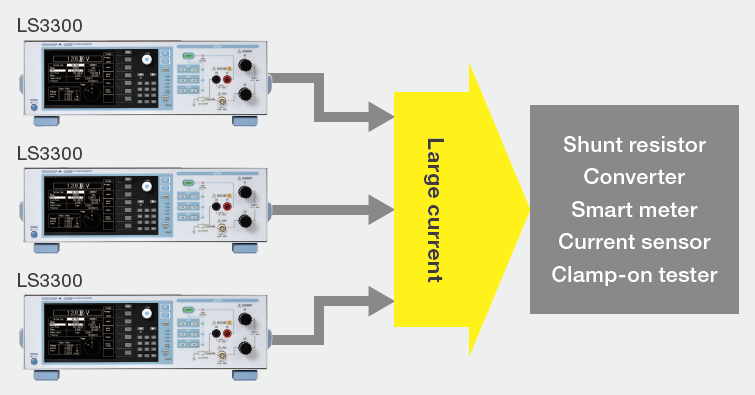 When users synchronize three units and connect their output in parallel, the system can output up to 180 A, when [Hi Current] is specified in the Wiring menu. 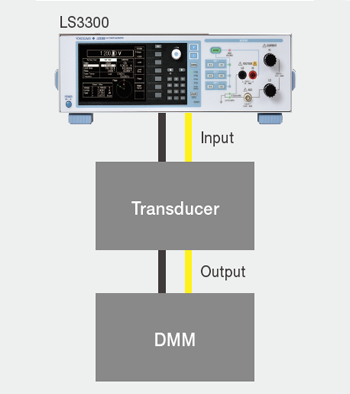 LS3300 supports devices requiring large current such as a current sensor, smart meter, etc. A large current sensor used for industrial equipment and a clamp-on power meter used to monitor energy-saving are widely used in the power measurement market. When a clamp-on power meter unit or external current sensor input (voltage output) is calibrated, an AUX terminal is used. The voltage output range of the auxiliary output is 0 to 6.25 V.
Users can select either the 500 mV or 5 V range according to the range of a current sensor input. The LS3300 is equipped with a 5.7-inch color LCD. It shows the wiring and power settings, as well as the phase chart of the generated waveforms, allowing users to quickly and easily view the instrument settings (as seen below). Users are also able to view the unit information such as the serial number, firmware version information, and communication settings in the UTILITY menu. 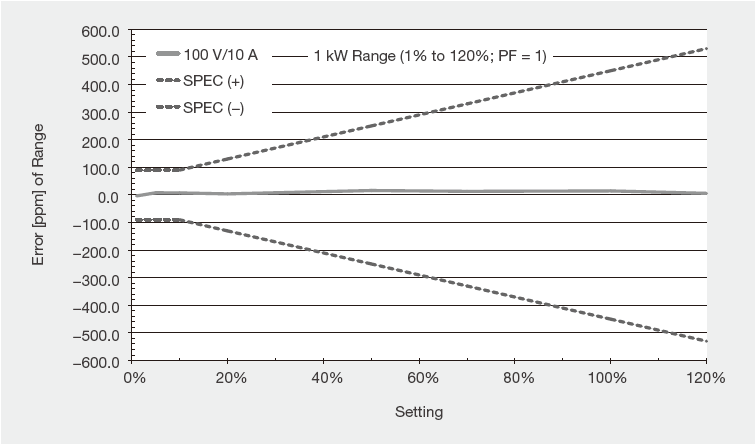 The values of voltage, current, active power and reactive power specified according to the level, level ratio and power factor are displayed as output values. To improve working efficiency, the LS3300 is equipped with a function for notifying the user that the output is stable. When the STABILIZING indicator disappears from the LCD (two seconds later), it means that the output has stabilized. This reduces time spent working with transient signals that affect measurement accuracy. This function notifies users of dangerous high voltage conditions when using high voltage ranges (300 or 1000 V). When the voltage output is set to 150 V or higher, the device beeps intermittently to notify users. If a connected load causes the output range to be exceeded, the Yokogawa LS3300 detects the abnormal load conditions to protect itself. 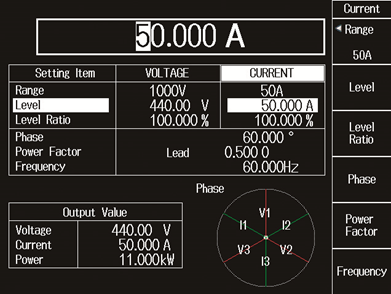 This function monitors the error of overcurrent, overvoltage, oscillation, fan malfunction and temperature. 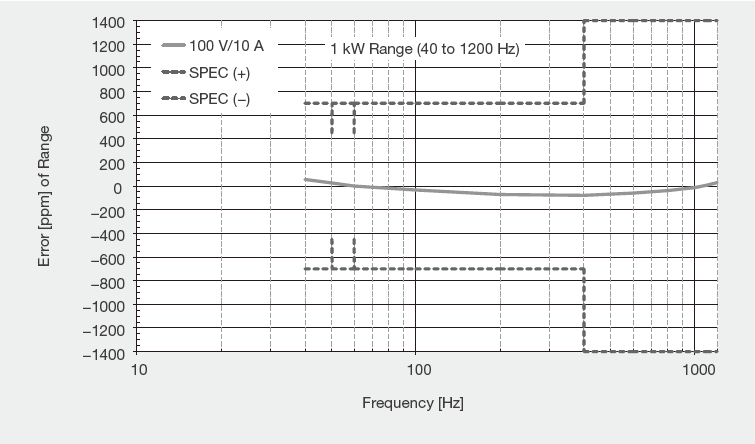 The output frequency of this product can be synchronized with commercial power frequency. 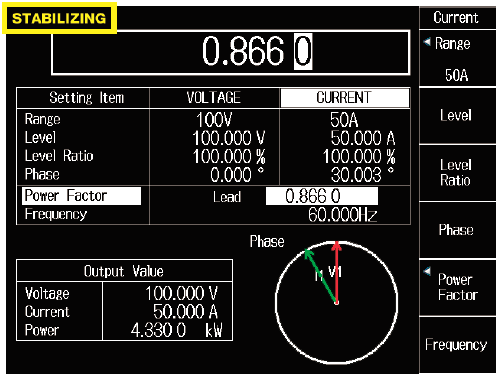 This feature is useful in verifying interferences from the power source. 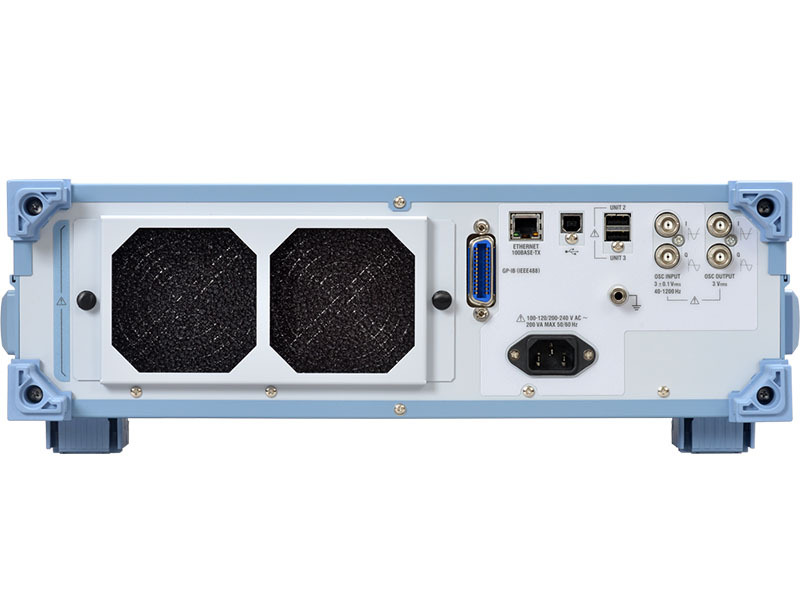 The LS3300 AC Power Calibrator is equipped with USB, Ethernet and GP-IB as standard communication interface to control external devices remotely. 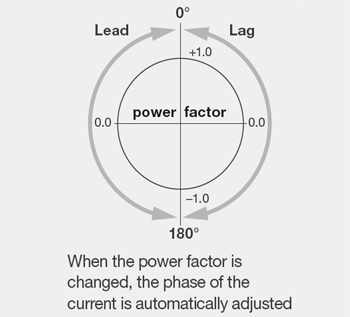 Power factor is an important element when users judge the efficiency of a device. Both power value and power factor are inspected during the calibration of a power meter. 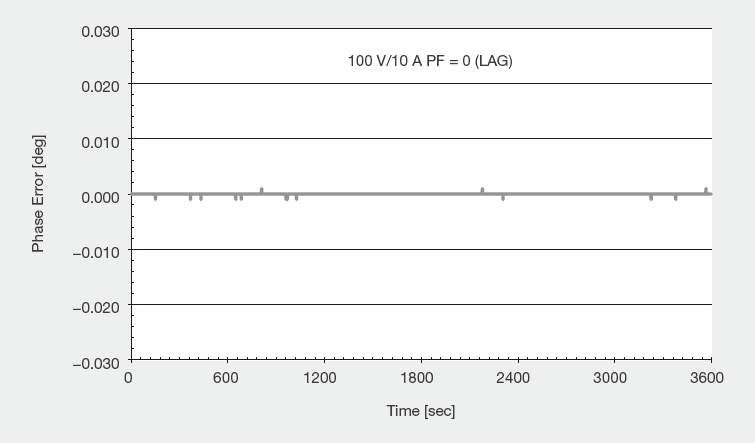 The LS3300 supports a power factor range from −1.0 to 0 to +1.0 (lead) and from −1.0 to 0 to +1.0 (lag). It also allows the user to adjust the phase angle between voltage and current. Since the LS3300 guarantees the phase accuracy between the master unit voltage (V1) and the slave unit voltage (V2), it can also be used to inspect phase meters. It is equipped with the phase accuracy of ±0.03° and the minimum resolution of 0.001°, which allows users to specify an arbitrary value for Lead and Lag of the slave unit voltage (V2) against the master unit voltage (V1). * The master and unit need to be connected with each other via a BNC cable for phase synchronization. There are different kinds of power transducer instrumentation for AC voltage, current, active power, reactive power, etc. The highly accurate LS3300 can output voltage with an accuracy of 350 ppm and current with an accuracy of 450 ppm It can also output AC voltage/current separately and set the phase angle of power. 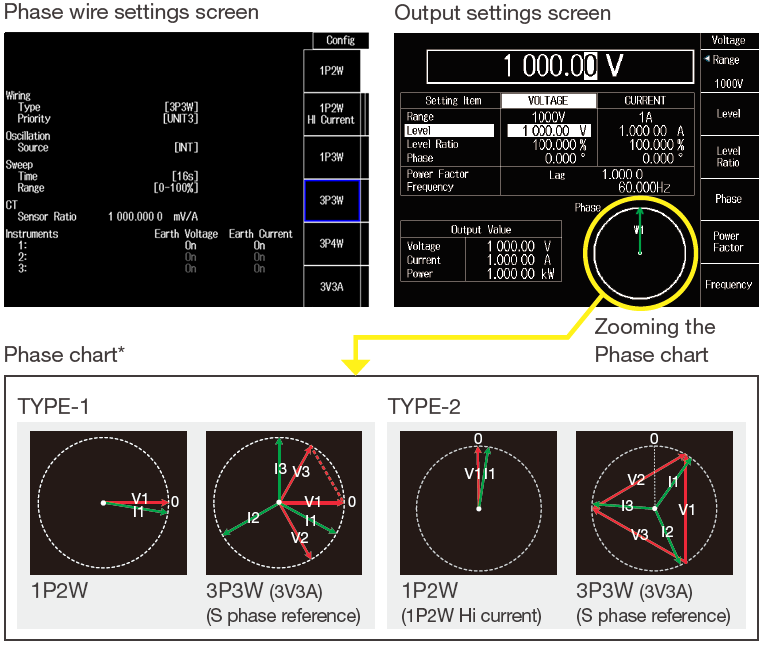 With these features, it supports input/output characteristic adjustment,inspection in the power transducer production lines, and calibration inspection for periodic checkups. This AC power calibrator is able to perform the Needle sticking tests with high reproducibility. If users stops sweeping halfway and hold the value near an arbitrary point, he/she can change the level ratio manually and perform an up/down sweep again. Users can set the sweep time to 8 s, 16 s, 32 s, or 64 s and the sweep range from 0% to 100%, 0% to 105%, 0% to 110%, or 0% to 120% of the output level. While the LS3300 can sweep voltage or current, it cannot sweep both simultaneously. * Power factor and Phase are not available in the sweep function. 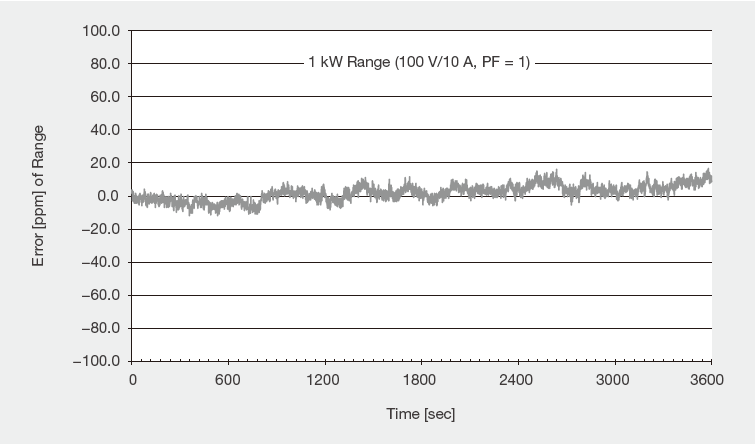 *1: The output level can be set up to 120% of the range. For outputs exceeding 120%, the ratio must be set to 100% or higher. Reduced energy, emission of CO2, NOx and SOx about 50% compared to the previous model. 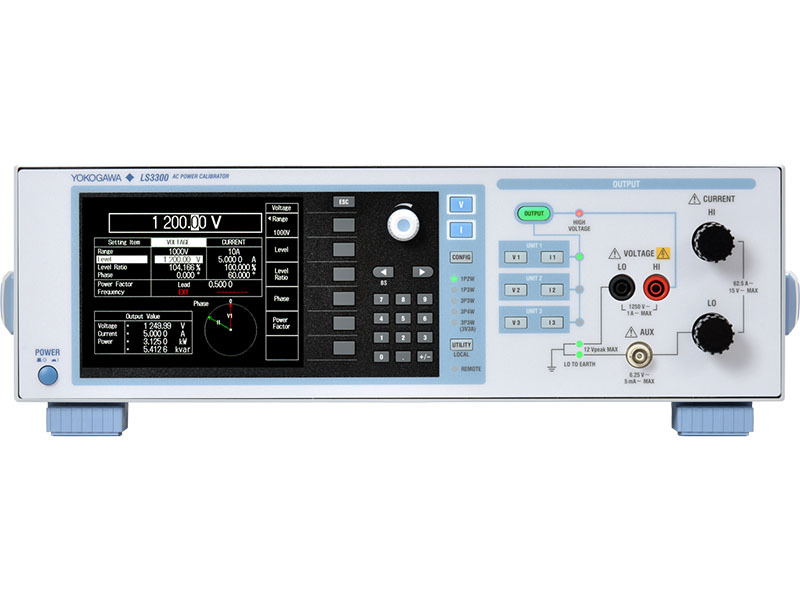 The Yokogawa LS3300 is a new dedicated, stand-alone and cost-effective calibrator that is designed to reduce the cost and complexity of calibrating power meters and analysers with accuracies up to 0.15%. 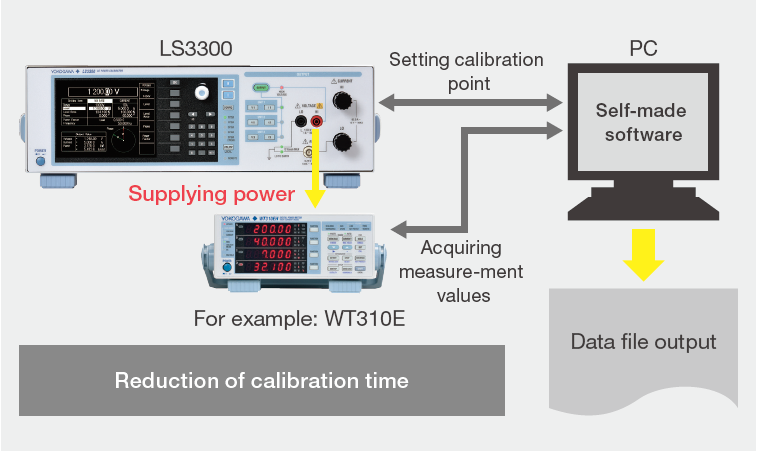 Unlike existing multi-function calibrators, the LS3300 provides a lower cost and easy-to-use solution with specific features for calibrating power meters.